Welcome To Skull Tower, Part XVII — Special Double-Size End Of Book Edition! Thus it was, that there came the eighteenth segment of the second chronicle of the three tomes, wherein A’pos’tro’phe The Sl’augh’ter’but’cher did battle Vwlss The Bldyfstd on the Fields Of Fauxtolkienia, or, in other words, we reach the section on the history of Arduin, the world and the nation. After we cover some other things. But First! The Mystery Of Jim(!) Resolved! Where am I going with all this? OK. See, at some point in this evolution, it became understood or implied that the characters, and the world, actually had a kind of existence even when not being actively played. No one wondered, or cared, what their Napoleonic figures might be doing between battles; they didn’t unpack them and then roll on the ‘Consequences Of Being At Liberty’ tables before each fight. When continuity between games started to matter, when you had acquired loot to sell and could engage in activities like making magic items or researching spells, there needed to be a place to do this, and then something clicked and people realized you could explore a town as you could a dungeon or a wilderness, that it could be a place as well, and then a kind of cognitive dissonance hit, as players noticed that while heedless slaughter and pillage made a kind of sense where no one else was portrayed as an actual person, just as sacks of hit points that bled gold and XP when you stabbed them, but, when put in a context of taverns and brothels (and, eventually, other, less important, buildings), it seemed a bit… odd. 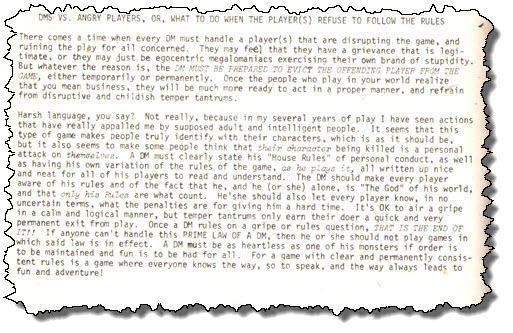 So it came to pass that as actual settings and worlds grew out of the primordial fog of wargaming abstraction, there would be codes of law that might be applied to errant PCs, and, eventually, such things began to be used to help define different cultures and nations in a world, continuing the transition from wargaming’s “every battle is unique in itself” to “a single world can hold uncounted adventures, with multiple campaigns occurring in the same, shared, setting”. Sort of how games like Wizardry I evolved, over time, into World of Warcraft. A footnote to the chart notes that all prison time is at hard labor, which is proper… the idea of a prisoner just sitting in his cell, costing money but doing nothing, is a fairly modern invention. Most medieval punishments were harsh and physical because you couldn’t keep someone around for a long period of time; you punished them and then let them go, presumably to either sin no more, or to sin so egregiously you could justify killing them. And now, after inns, timekeeping, holidays, guilds, and religious sects… we get to the actual history of Arduin. The first rulers of the world were the “dread reptilian Kthoi”. They warred against the “first true men”, the Rune Weavers, who won. But the Rune Weavers met their downfall a half million years later, battling the Titans and the Star Powered mages “against the rest of Allmanity”. 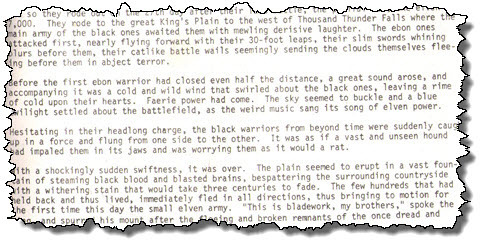 Though the Rune Weavers won (I think… the text is a little unclear, a bit too poetic for its own good), they were so weakened that “a bare 20,000 years later”, when the Time Lords threatened, the Rune Weavers could only trap them (the Time Lords, I think), in the Caverns of the Ancients and then “fade from the kin of Allmanity”. We’re about 20% of the way through the second paragraph, by the way. This allowed the Free Mages Of The Circle to predominate, followed by 3,000 years of relative peace. Then a bunch of aliens invaded, destroying the fifth continent and leading to the Interregnum Of The Dark Years for the next five millennia. Civilization restarted on Khaera, the third continent. Many nations held power as many wars were fought. Or, in other words, like every part of history in what we like to call reality. The real problem, though, was when the College of Sages in Falohyr discovered multiple transdimensional space kablooies (I, erm, may be paraphrasing slightly) manifesting in an area contiguous with the small kingdom of Arduin. This began the “Wars Of When” (oooohhhh, awesome name! ), which lasted another 10,000 years, “bleeding the world white of population and magic”. We just finished the second paragraph. In paragraph three, we learn every nation in the Accord sent settlers to Arduin, as the original population was wiped out in the war; for 500 years, it was forbidden to marry anyone of your own original nationality. So, wait… after the first generation, everyone has two ancestral nationalities… so they’re equally forbidden to marry either… and then the third generation has four forbidden groups, then eight… I don’t think Dave did the math on this bit. It’s no longer a law, but it’s traditional to marry outside one’s nationality, which, by now, must include every nation on Khaas, so, I guess, people in Arduin just live in sin. The Accord has lasted 1,211 years. Pretty good. However, we can’t forget about the Elf-Human wars. You didn’t forget about the Elf-Human wars, did you? I sure hope you didn’t! Never forget about the Elf-Human wars that weren’t mentioned until just now! The phrase “Twice the iron grey cataphracts of Viruelandia surged up from the south” appears in the text I am about to summarize. If that alone is not justification for the existence of the Arduin trilogy, what could be? Please note, I saved y’all some googling by linking to the definition of ‘cataphract’. I hope you appreciate that. The wars began “dim thousands of years in the dark and bloody past”, or well before the “Accord of Arduin”. They began early on, when King Tarafass Dawnstar of the Royal House Of The Rising Sun heard what the sages of Falohyr had found, and he “called up his silver mailed cavalry, his bronze-sheathed and rock-steady spearmen, and his silent archers all clothed in forest green”. The Forest of Flame is now the Weeping Woods due to the massacres that occurred there. The humans retreated back to the mountain pass they’d invaded from, only to find the Elven king, Tarafass, and his host waiting for them. The Morvaens charged, believing themselves to have superior numbers, but then Tarafass reminded them they were in a universe where magic worked, by revealing the massive cavalry hidden under an illusion. Long story short, Morvaen’s army got massively pwned, to the point where, for decades afterwards, every town message board was covered with “nerf invisibility” demands. The elves won that battle, but not the war, as seven more invasions followed, including two that involved “iron grey cataphracts”. All failed except the seventh (which kind of makes sense, because you don’t stage invasions after you’ve invaded), which came (irony alert!) from “one of the very gates the elves were trying to protect”. A horde of deodanths from “a dying Earth” came, “their flickering swords a match for even elven blades”. In 13 days, they’d conquered all but the great keep of the high king. And then…. well, I’ll deal with it next week, as we finish out the history of Arduin, and get back to the inns and roadhouses of Arduin. Yes, really. That’s Two In A Row I’ve Missed. I’m Going Through Chinese Food Withdrawal. This needs a scan, sorry. It’s too awesome to bullet point. I use ‘awesome’ a lot, don’t I? Let me try again. It’s too freakin’ unbelievably mega-awesome to bullet point. See what I mean? When I write histories and backstories and the like for my own settings, unless constrained by editorial fiat (well, given the budgets of most game companies, more like editorial Used 1992 Honda), I write in this style. This is pure purple pulp, perfect for RPGs and alliteration. Slaughtering the deodanths took two more weeks. The King was ambushed and slain. The defeat of the deodanths, “one of hell’s own armies”, gave “many a grasping and scheming king pause”. The daughter of the slain king, Tarathala Dawnstar, declared herself queen of Arduin. “The human wolves gathered round their borders in ever growing numbers”. “…the road to gods and demons, the trail of tears and danger.” So. Freakin’. Awesome. This is a major part of the appeal of old school. The power. The energy. The “turn it up to eleven” attitude long before “turn it up to eleven” was a phrase. Yeah! This needs to be animated, Heavy Metal style. Seriously. Why hasn’t it been? Get a Kickstarter going, or something. So, now that we’ve finished the epic history of the world, stretching back a million years or more, what next? A list of inns and roadhouses, of course! Only 14 pages past where they were discussed originally. Old school, dude. What can you do? This table goes on for four full pages. This says a lot about the detail Dave put into his world, or maybe he just liked making up bar names. We will (probably) never know if they were each written up specifically, or if nothing but a name and a rating were ever defined. 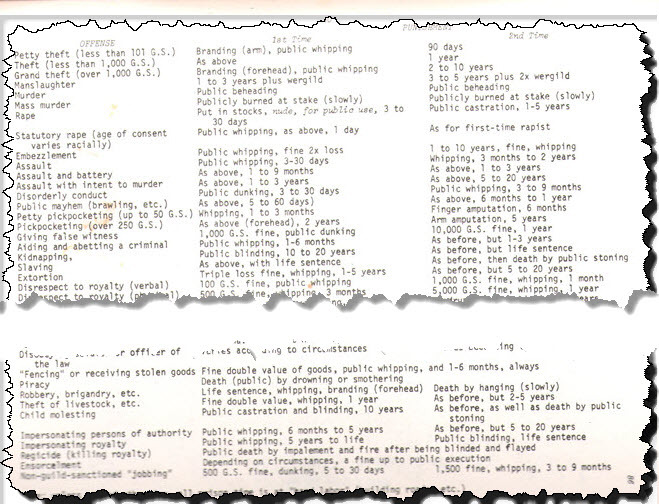 OK, we’ve covered inns, dates, holidays, religions, guilds, history, and inns… what’s next? I have a love, in my own games, of pan-dimensional, alternate-reality, genre mashup themes. I like vast canvases I can paint on, usually in broad strokes, but sometimes drilling down to ridiculously fine details… like covering a million years of history in one long paragraph and then having four pages of inns. I’ve mentioned the “variable detail” aspect of old school before; this is just another example. We reach nearly the end of Welcome To Skull Tower. What’s at the very end? The Table of Contents, of course. Seriously. It’s on the inside back cover. Perhaps Dave should not have asked Bizarro Number One to help with the layout. Next time… maybe next week, maybe not, I might decide to take a brief break for other projects, or I might keep on with this… weekly content is good, and knowing what I’m going to write about each week really helps me produce something… we will get to the third book, The Runes Of Doom! If you enjoy this series, please, pass the links around. If you don’t enjoy this series, pass the links around to people you hate. Or Bldfstd, according to some scholars. For sufficiently small values of ‘hilarious’.